ACTS and hungry citizens of Oconee County need our help. Director Reiny Hiss told me recently that they are out of everything.He recently spent $ 4,000.00 to purchase food. ACTS desperately needs funds and food. Can-A-Thons and gifts help provide much food.However, the tremendous need outstrips the donations. According to Reiny Hiss, ACTS is currently buying most of the food it distributes. The need is greater than ever! 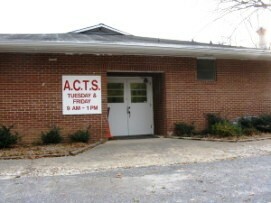 Referrals for families are made to ACTS by churches, DFACS, and ACTION, Inc. There are many opportunities to assist ACTS by receiving, sorting, and restocking shelves with food and clothing as well as preparing and distributing food baskets. Corporate information and officers are available on the Corporations Website of the GA Secretary of State. AREA CHURCHES TOGETHER SERVING, INC.